HARLINGEN — Ray Simon chipped and sliced off slivers of raw wood with a sharp knife. He was carving out a baseball player for his son at the Chip-O-Tex Woodcarvers Club. A few seats away, Wally Ellefson was smoothing down a custom walking stick he whittled with sand paper. And at the table across from Wally, Wes Pierson was digging into the foot area of a Teenage Mutant Ninja Turtle figure he was making for a friend. Each of them had been working on their projects for weeks during the club’s weekly Tuesday morning meeting at Park Place Estates in Harlingen. 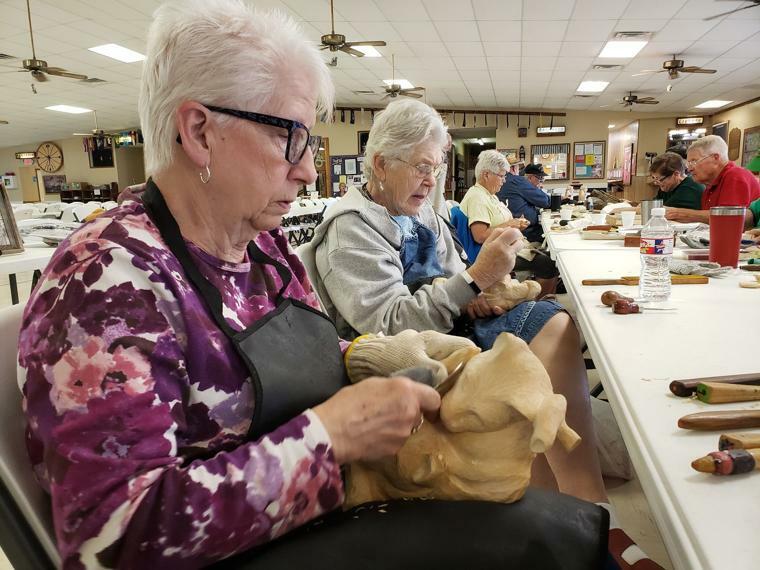 They were a few of many wood carvers getting ready to show off their work at the 29th Chip–O-Tex Woodcarvers Annual Show next month. The show will also feature woodcarving vendors and demonstrations from local and well known woodcarvers. This year marks the 29th show for the Valley wide Winter Texans’ club. It will be held February 15 and 16 at Casa De Amistad, located at 1204 Fair Park Boulevard. General admission is $3. And children under 12 can enter for fee. Chip-O-Tex Woodcarvers Vice President Ken Eberle said the event is open to all carvers who are interested in having their work judged. He stressed for participants to sign up by 8 a.m. on Friday the day of the event. Last year, 135 entries were judged, and organizers are hoping for an even bigger turnout this year. The event draws more than 1,000 visitors during the two days. Pierson said he didn’t know what a Teenage Mutant Ninja Turtle was until he started carving one. He didn’t have a picture of the famous turtle or toy replica to base his work off of. But he kept chipping away wood from head to toe as the model turned more and more into its likeness. WHEN: Friday 9 a.m. to 4 p.m.; Saturday 9 a.m. to 3 p.m.